The 2016 New York Yankees season was the 114th season in New York City for the Yankees, and the 116th season overall for the franchise. Throughout the season, the Yankees wore a #8 patch in memory of Hall of Famer Yogi Berra. It was the final season for Alex Rodriguez and Mark Teixeira. On October 18, 2015 the Yankees fired their hitting coach, after just one season, Jeff Pentland. On November 2, it was announced that Alan Cockrell who was hired as the assistant the season before; will assume the role as hitting coach, with Marcus Thames as his assistant. On November 11, the Yankees traded John Ryan Murphy for Aaron Hicks. On December 9, the Yankees traded Adam Warren and Brendan Ryan to the Chicago Cubs in exchange for Starlin Castro. Also on December 9, the Yankees traded Justin Wilson to the Detroit Tigers for pitching prospects Luis Cessa and Chad Green. On December 28, the Yankees traded Eric Jagielo, Rookie Davis, Tony Renda, and Caleb Cotham for Aroldis Chapman from the Cincinnati Reds. On January 8, 2016, the Yankees purchased Kirby Yates from the Cleveland Indians. On January 17, the Yankees claimed Lane Adams off waivers, from the Kansas City Royals. On February 21, the Yankees signed free agent Chris Parmelee. On April 4, the Yankees traded Carlos Corporán to the Tampa Bay Rays for cash considerations. Aaron Hicks threw a record breaking throw from the outfield to the infield on April 20. After the Yankees opening day was rained out, the Yankees played it a day later on April 5, losing 3–5 to the Houston Astros. The Yankees would go on to win their opening series two games to one against Houston. The next series, the Yankees went to Detroit to face the Detroit Tigers, taking one game and losing one game before having the final game postponed for an eventual make-up. The Yankees would go on to lose their next three series against the Blue Jays, Mariners, and the Oakland Athletics (a series in which they were swept). The Yankees would take two games in a three-game series against the Tampa Bay Rays at home. They finished April poorly with four game losing streak against the Texas Rangers and rival Red Sox. The Yankees finished April with a record of 8–14. On April 12, Starlin Castro recorded his 1000th career hit. On April 20, Aaron Hicks recorded the fastest recorded throw tracked by Statcast in a 2–5 loss to Oakland, throwing out runner Danny Valencia at home plate. The throw was recorded at 105.5 miles per hour (169.8 km/h). May saw a better overall month for the New York ball club. Despite opening with a loss to the Red Sox and a losing series against the Baltimore Orioles, the Yankees would host Boston at home and win the series before winning a four-game series against the Kansas City Royals at home in a series where they won three of the four games. To extend on that homestead, the Yankees took a series against the Chicago White Sox where they won two of three games. They traveled to the west in interleague play where they lost a series against the Arizona Diamondbacks, but returned home after sweeping a four games series against the Athletics. The Yankees lost another series to Toronto before winning a series against Tampa Bay. They lost their last two games of May against Toronto. The Yankees finished May with a record of 16–13. On May 16, Carlos Beltrán recorded his 400th career home run. June saw similar results to May, as the Yankees finished with one less win for the month than they achieved in May. The Yankees finished June with an impressive home record standing at 10 wins and 6 losses combated by a subpar away record of 5 wins and 6 losses. On June 17, Alex Rodriguez achieved his 3100th hit. The Yankees finished July with 13 wins and 13 losses. The Yankees sent three players to the 2016 Major League Baseball All-Star Game: Dellin Betances, Andrew Miller, and Carlos Beltran. Mark Teixeira recorded his 400th career home run away against the San Diego Padres on July 5, becoming just the fifth switch hitter to do so in Major League history. Carlos Beltrán recorded his 1500th career run batted in on July 16. The Yankees became sellers towards the trade deadline, cutting a massive amount of salary shipping away various players. The Yankees dealt closer Aroldis Chapman to the Chicago Cubs in return for shortstop prospect Gleyber Torres, minor league outfielders Rashad Crawford and Billy McKinney, as well as right-handed pitcher Adam Warren who previously played for the Yankees the season before. The Yankees traded lefty pitcher Andrew Miller to the Cleveland Indians for minor league outfielder Clint Frazier, minor league left-handed pitcher Justus Sheffield, and minor league right-handed pitchers J. P. Feyereisen and Ben Heller. Pitcher Iván Nova was traded to the Pittsburgh Pirates for two players to be named later. The Yankees also traded veteran outfielder Carlos Beltrán to the Texas Rangers for pitchers Dillon Tate, Erik Swanson, and Nick Green. Alex Rodriguez during a game on August 2. In early August, both Mark Teixeira and Alex Rodriguez announced their retirement from the team. Mark Teixeira announced on August 5 that he would retire following the conclusion of the season. 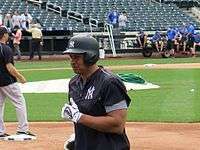 Alex Rodriguez days later announced he would play his final game August 12, four homers short of 700. He would become an assistant to the team following his final game. The Yankees acquired Blake Parker in early August as well. After Alex Rodriguez's release by the organization, Tyler Austin and Aaron Judge were called up and made their debuts, hitting back-to-back homers in their first big league at-bats. 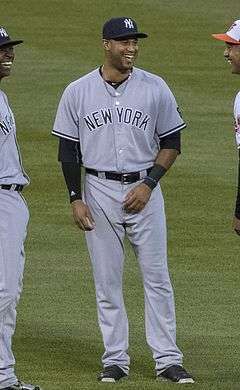 Young Yankees catcher Gary Sánchez became the fastest player to record 11 home runs, accomplishing so in just twenty-three days. They finished August 17–10. The Yankees started September off to a hot start, after dropping the first two games of September they won seven straight games. — Apr 4 Astros Postponed (rain). Makeup date: April 5. — Apr 10 @ Tigers Postponed (rain). Makeup date: June 2. ↑ "Photos: Astros win season opener against Yankees, 5-3". Khou.com. Retrieved April 10, 2016. ↑ Axisa, Mike. "WATCH: Mark Teixeira becomes fifth switch-hitter to hit 400 career home runs". CBS Sports. Retrieved August 11, 2016. Teixeira is the 55th player in history to hit 400 home runs overall, though he's only the fifth switch-hitter to reach that mark. ↑ Adams, Steve (July 25, 2016). "Cubs Acquire Aroldis Chapman". MLB Trade Rumors. Retrieved August 11, 2016. ↑ Adams, Steve (July 31, 2016). "Indians Acquire Andrew Miller". MLB Trade Rumors. Retrieved August 11, 2016. The Indians have dramatically fortified their bullpen as they look to further pad their lead on the American League Central, announcing on Sunday morning the acquisition of left-hander Andrew Miller from the Yankees in exchange for outfield prospect Clint Frazier, minor league left-hander Justus Sheffield and minor league right-handers Ben Heller and J.P. Feyereisen. ↑ "Pirates trade Jon Niese back to Mets, get Ivan Nova from Yankees". WTAE.com. Retrieved August 11, 2016. ↑ Todd, Jeff (August 1, 2016). "Rangers Acquire Carlos Beltran". MLB Trade Rumors. Retrieved August 11, 2016. ↑ Thompson, Rich (August 10, 2016). "Yankees' Mark Teixeira good to go into retirement". Boston Herald. Retrieved August 11, 2016. ↑ Schmidt, Samantha (August 7, 2016). "As Alex Rodriguez Prepares to Retire, Fans Grapple With a Complicated Legacy". New York Times. Retrieved August 11, 2016. ↑ Ebenezer Samuel. "Tyler Austin, Aaron Judge hit back-to-back homers in Yankees debut as Bombers blast the Rays, 8-4". NY Daily News. Retrieved August 15, 2016.